With Peak Oil we are facing the catastrophic failure of the food distribution system. Farmers are unprepared for unstable fuel prices. Ethanol is building a false and unsustainable false farm economy. Most people do not know how to grow a substantial part of their food needs. Zoning laws prohibit food growth in suburbia. Between 2002 and 2007 there has been a five-fold increase in the price of oil. That trend will continue until the food distribution system collapses. It is necessary to re-tool transportation before the crisis. The risks are indicated by food miles study. 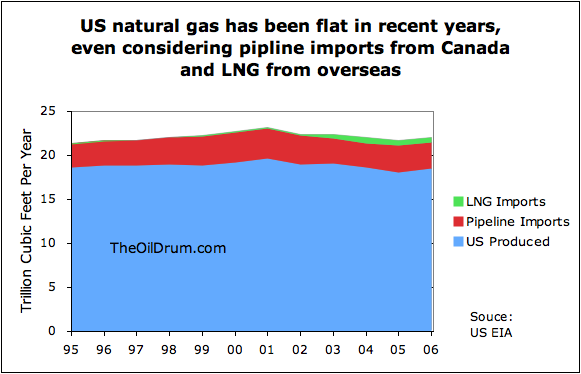 We don't have as good projections regarding future natural gas supplies as oil supplies, but it is pretty clear that the US is headed for a decline in available natural gas. Our current production is flat, and we are dependent on imports and liquefied natural gas (LNG) to meet our needs:"
"We keep having to drill more and more, to keep our current production flat:"
"The question becomes one of how much drilling we can do for natural gas, before costs exceed the value of the natural gas produced. 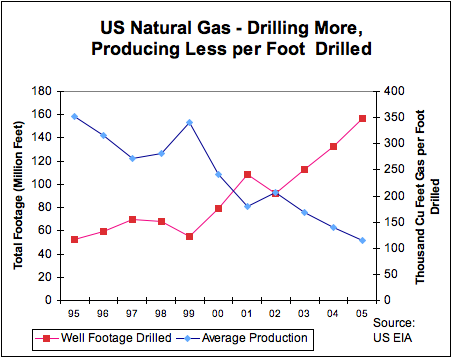 Heading Out wrote a post recently pointing out that gas production from the Barnett Shale does not seem to be economic at today's prices."